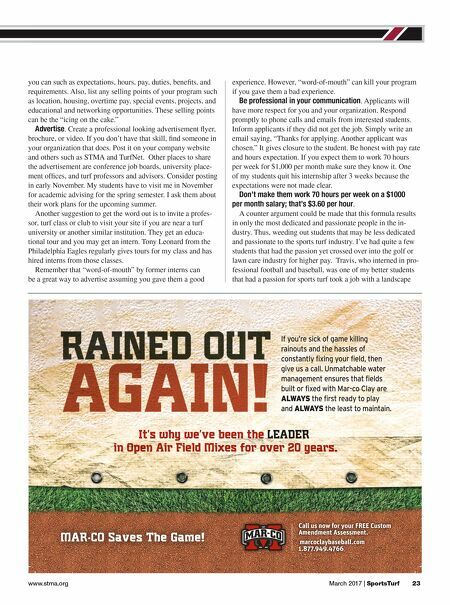 FACILITY & OPERATIONS 22 SportsTurf | March 2017 www.sportsturfonline.com FINDING INTERNSHIPS AND ATTRACTING INTERNS This article is intended to provide practical information for both sports turf managers and students in regards to internships based on my 20 years of matching students with employers. THE INTERN MARKET The marketplace for interns has significantly changed in the past few years. There is a big shortage of turf interns for both the golf and sports turf industries. The main reason for the shortage is fewer students have been enrolling in universities to study turf. From speaking with colleagues at other universities, the enrollment in turf is about half of what it was in 2008; however, the demand for interns is still strong. A result of this change in supply is that it's difficult for employers to find interns but very easy for students to land an internship. One of my students recently had three internship offers and he used the offers to negotiate pay and benefits. From monitoring jobs sites like TurfNet, I noticed recently that employers in the golf industry have begun to increase wages and other perks in order to attract interns. In fact, in a quick search on TurfNet in January, I noticed the typical wage rate for golf course interns was $12-15 per hour plus overtime, and many courses offered free housing. So some interns are making $6,000 and $7,000 over the summer on a golf course. 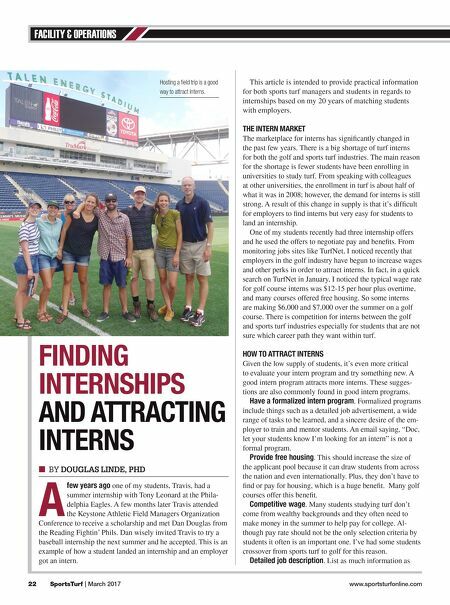 There is competition for interns between the golf and sports turf industries especially for students that are not sure which career path they want within turf. HOW TO ATTRACT INTERNS Given the low supply of students, it's even more critical to evaluate your intern program and try something new. A good intern program attracts more interns. These sugges- tions are also commonly found in good intern programs. Have a formalized intern program. Formalized programs include things such as a detailed job advertisement, a wide range of tasks to be learned, and a sincere desire of the em- ployer to train and mentor students. An email saying, "Doc, let your students know I'm looking for an intern" is not a formal program. Provide free housing. This should increase the size of the applicant pool because it can draw students from across the nation and even internationally. Plus, they don't have to find or pay for housing, which is a huge benefit. Many golf courses offer this benefit. Competitive wage. Many students studying turf don't come from wealthy backgrounds and they often need to make money in the summer to help pay for college. Al- though pay rate should not be the only selection criteria by students it often is an important one. I've had some students crossover from sports turf to golf for this reason. Detailed job description. List as much information as ■ BY DOUGLAS LINDE, PHD A few years ago one of my students, Travis, had a summer internship with Tony Leonard at the Phila- delphia Eagles. A few months later Travis attended the Keystone Athletic Field Managers Organization Conference to receive a scholarship and met Dan Douglas from the Reading Fightin' Phils. Dan wisely invited Travis to try a baseball internship the next summer and he accepted. This is an example of how a student landed an internship and an employer got an intern. Hosting a field trip is a good way to attract interns.